1. Role model. Eat well and talk to kids about your own decisions in class when it’s appropriate. Avoid being “too preachy” but remember, you are an authority figure to most kids. 2. Include nutritional information to parents in any of the open houses or school newsletters or school websites. My favorite book for kids is “Brain Foods for Kids by Nicola Graimes. For adults, learn about how nutrition affects your own brain in “The Edge Effect” by Eric Braverman. 3. Do food-related class research projects. Divide your class randomly in half. Each does something different. Use simple tasks to measure pre and post. Let students discover the difference on their won bodies and mind. 4. Include nutritional information in units on science, the body, health and physical education. There are plenty of ways to slip it into the curriculum. 5. Work with the school cafeteria staff. Provide a few snippets from the best books. Let them ask you for more information. 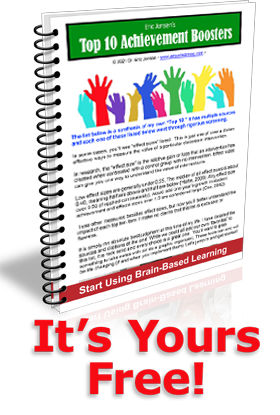 Do you think about the brain at your school very often? Is your school cafeteria helping or hurting your kid’s academic performance? Many who are still unwilling to read the research claim that what you eat doesn’t matter very much. They are wrong. Many early studies were not done with a strong experimental protocol or they were done on malnourished kids. But more recent ones have used the “gold standard in research (blind studies, large sample sizes, cross-over design) and they have found that school nutrition does matter. Recently, two large and high-quality studies (both randomized, double-blind), used a total of 780 typical, healthy school aged children. All were given either a combination of vitamins and minerals, a supplement of omega-3 essential fats EPA and DHA, or the vitamins and minerals with the omega-3 fats, or a placebo on 6 days a week for 12 months. Another study was testing diets for an eight-week trial comparing a low carb high fat diet (LCHF) with a conventional high carb low fat (HCLF) weight loss diet. Researchers found that the people on the low carb diet lost more weight than those on the low fat diet. But they also had better processing speed in the tests–their brains worked faster! (Halyburton AK et al., Am J Clin Nutr. 2007). Hint… DO NOT listen to the naysayers. They are behind in their science. Yes, nutrition does matter! This is just another example of brain-based learning at work. In our school, food matters a lot because we serve 1,100 lunches a day!!! We have a snack bar where we only sell nutritious snacks, plenty of fruits and home baked goods. We have three chefs and a food engineer who are constantly searching for best quality foods for kids and adults. This is a great and important article for all people to read! Thanks! Research regarding povtery and education is very important. I personally worked in a school for about a year where our student population was almost all living in some type of povtery. Many of the sources from our learning session this week mentioned observations that were familiar. One of the videos in the PowerPoint was an interview with a povtery-stricken youth. She mentioned that students living in povtery do not think of a future, they only think of the present. It was also mentioned in the research article regarding learning design. I witnessed that day in and day out for about a year at my old school. I personally feel that is one of the most difficult obstacles to overcome, because education is a door to the future and generally not designed for instant gratification. The most common question I would be asked by my students was why do I need to learn this? . That can be a difficult question to answer when it comes from that population of students. And as much as a teacher would like to assume that these students should be able to learn just as a middle-class or upper-class student, that is not the case. As the video form this week explains, the brain can actually change from the stress of living in povtery. Stress can affect the neurons in the brain. As Jensen explains in the video, when the brain is exposed to chronic stressors, it goes into survival mode and limits the capabilities of the brain to conserve. Poverty-stricken students are constantly in survival mode, wondering where their next meal is coming from or where they may sleep that night. These things that most students take for granted are constant question marks in the world of povtery.